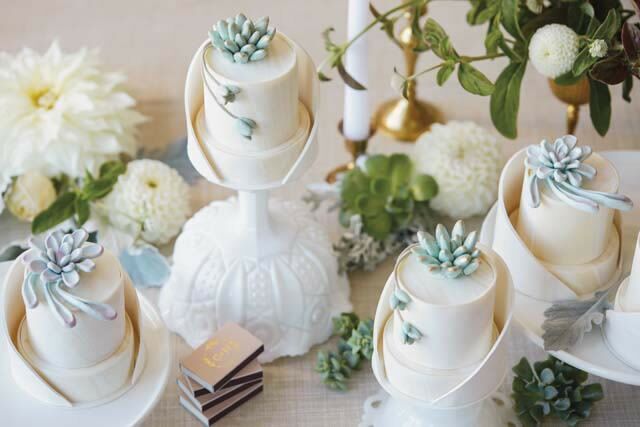 Brilliant local bakers match emerald succulents with sleek white cakes, spinning sugar dreams into enchanting centerpieces. This gorgeous three-tiered wonder from Lilac Cake Boutique features handmade gum paste succulents, marbled gum paste hexagons, and hand-painted gold leaf. Inside the marbled fondant is a pistachio cake with raspberry ganache filling, coconut cream, and touches of toasted coconut, $9/serving. 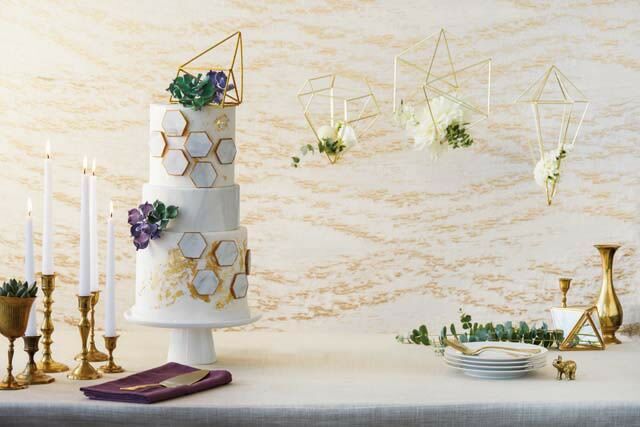 Cake stand, candles, gold hexagon, hanging prisms, linens, and elephant from Bridal Bliss. Plates, forks, and napkins from CORT Rentals. Eucalyptus, dahlias, and succulents from Bash & Bloom. (Prices not listed available upon request.) Serving set photographer’s own. 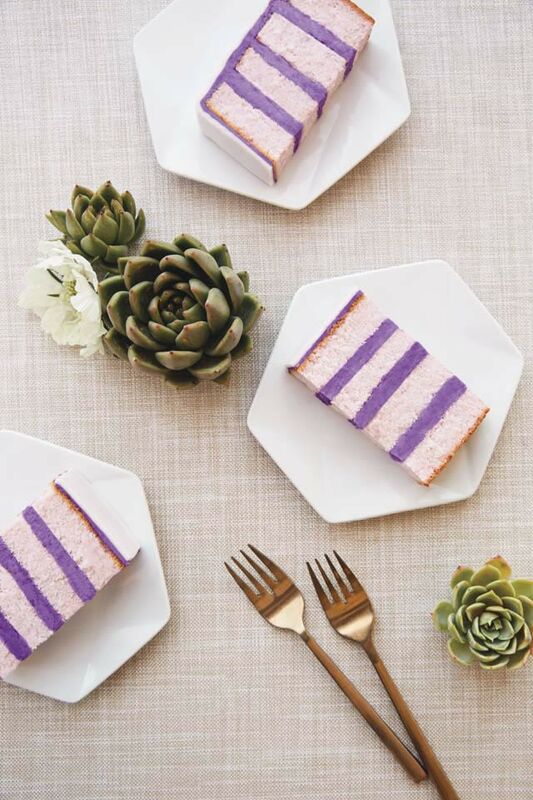 Slice and serve these cute little four-layer lemon zest cake slices with marionberry cream cheese mousse filling, $2.95/serving from Mike’s Amazing Cakes. Plates photographer’s own. Forks from CORT Rentals. Succulents from Bash & Bloom. Make a statement with these elegant two-tiered mini cakes, draped in marbled white chocolate and decorated with hand-formed white chocolate succulents dusted with gold, also from Mike’s Amazing Cakes, $40 each. Cake stands, custom matchbooks, and candles from Bridal Bliss. Milk glass, gold candlestick, and chalice from Fanciful Rentals. Locally grown bouquet featuring dahlias, dusty miller, spiral eucalyptus, gomphrena, Helga Piaget garden roses, blushing bride protea, and succulents from Bash & Bloom. 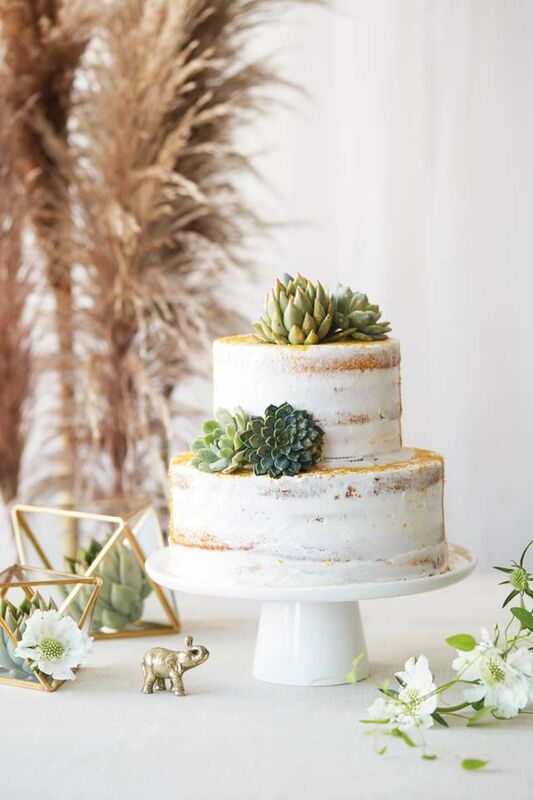 Naked cakes are all the rage right now, whether they feature only fillings between layers or come complete with a thin crumb coat like this two-tiered, gold-dusted, succulent-topped creation from Madison Park Bakery. The marbled cake has a hazelnut buttercream filling with a thin white buttercream frosting, $5.50/slice. Succulents from Martha E. Harris and Gifts. Cake stand, elephant, and pampas grass from Bridal Bliss. Gold prisms from West Elm, $22/small, $28/large. Plates and forks from CORT Rentals. Scabiosa and sweet autumn clematis from Bash & Bloom. 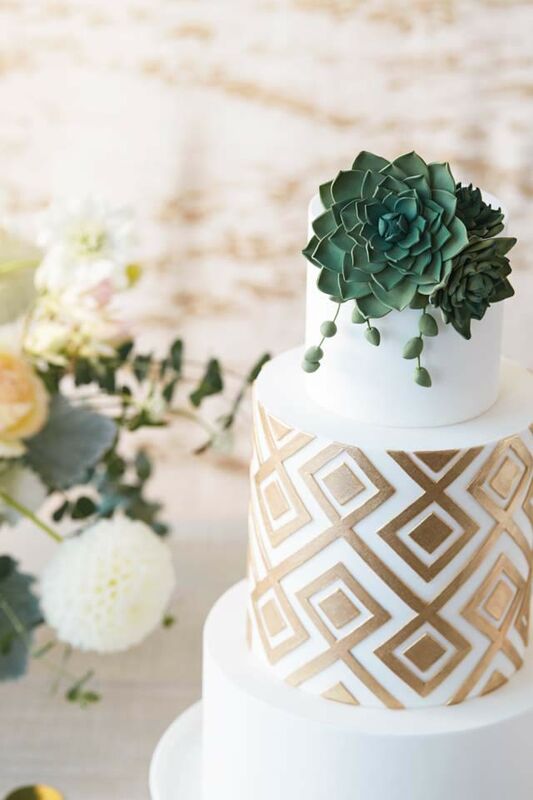 This luxe cake from Baked marries classic with contemporary, the two white tiers offset by a gold geometric fondant layer. The succulent crown is made of sugar, while the cake itself is lavender strawberry with strawberry buttercream filling and a fondant frosting, $13/slice. Floral arrangement from Bash & Bloom (price upon request).